Music is a subject often discussed and argued about. These arguments are about the merits of one track, one album or even one artist over others. No one persons opinion should be more valid than anothers but there is (arguably!) very little in the arts that divides opinions as much as music. I’ve always avoided these arguments simply because much of the music I love appeals on so many levels that it is impossible to even define to myself why I love it, much less explain it to someone else! (plus of course, I have far better musical taste than anyone else anyway!) What I will say however is that as far as I’ve been concerned for the last four decades, the greatest singer/songwriter ever is John Prine and the best album ever is his debut, simply titled ‘John Prine,’ although I do admit that despite his huge abilities not every album is great, some are merely very good! 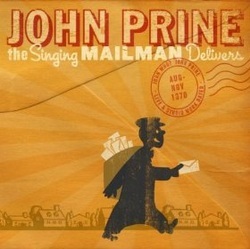 This new release is not a new recording, in fact it contains songs that any Prine fan will know intimately! But hell !!! ……….. it’s John Prine and any Prine recording, particularly if it is something previously unreleased from his early days, has got to be cause for celebration! Apparently the contents of these two discs, the second is a live gig, were found when he was rummaging through his garage and stumbled across what are reputed to be his first ever recordings. Whether some more forgotten tapes will turn up one day who knows, but for now these will have to suffice as the earliest recordings of this great songwriter and poet. Disc one consists of early but surprisingly fully formed versions of five songs that would soon appear on his debut ‘John Prine,’ whilst the remainder would be recorded for subsequent albums. Each and every one is a gem but the five from his debut are true classics, but for me one is above all others. That one is Great Society Conflict Veteran’s Blues, the song that would soon have it’s title changed to Sam Stone, the greatest of all anti-war songs. There is no killing or hysterical rhetoric in this song, just the simple tale of a Vietnam veteran who comes home to his family shell shocked, wounded and addicted to drugs and tells the story of his descent into illegal drugs and eventual demise. A quite harrowing song. I’ve recently ploughed through the enormous box set ‘Next Stop Vietnam’ and despite the incredible feat of putting all these volumes together there is nothing to compare to Sam Stone. The other songs from that debut are Hello in there, Paradise, Illegal smile and Flashback blues all incredibly descriptive songs, even including a little humour which just seems to increase the power. The Live disc shows his easy going stage prescence was already well developed in his early days of performing. It’s easy to see why audiences take to him so well with his slightly self deprecating demeanour, but of course there are always those tremendous songs. It’s pointless saying more about the contents of these two discs. If you know Prine’s work you are already aware of his abilities. If you are not familiar with him buy this album and his debut. It won’t be long before you start to fill the forty year gap between these two great recordings!